Learn more about the Enterprise Architecture and the important role it can play in securing your business. 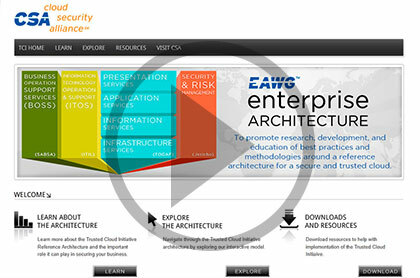 Navigate through the Enterprise Architecture by exploring our interactive model. Interact with the Enterprise Architecture by utilizing the scenario tool to find out how it applies to your business. The Enterprise Architecture helps cloud providers develop industry-recommended, secure and interoperable identity, access and compliance management configurations, and practices. We develop reference models, education, certification criteria and a cloud provider self-certification toolset. This is being developed in a vendor-neutral manner, inclusive of all CSA members and affiliates who wish to participate. © 2011 - 2019 Cloud Security Alliance. All rights reserved.